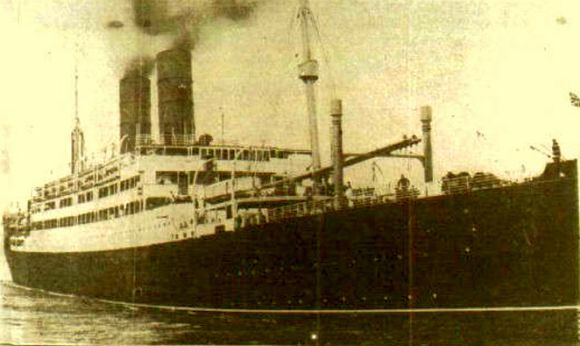 The liner Tuscania was delivered to its owners, the Anchor Line, at the beginning of 1915 for the joint service with Cunard from Glasgow to New York via Liverpool. Its maiden voyage on 6 February of that year was on this route, on which it traveled for the rest of its career. In September 1915 it helped rescue passengers for the Greek Line's ship Athini which had caught fire in the Atlantic. Tuscania first undertook trooping duties in September 1916, carrying Canadian troops from Halifax, Nova Scotia, to Liverpool. In August of the following year she brought 1,236 men of the 16th U.S. Engineer Regiment from New York to Liverpool, and two more successful voyages followed. Tuscania was the first ship carrying American troops to be sunk, and public opinion in the USA regarded its loss as an outrage. In 1920 the American Red Cross erected a monument on the Isle of Islay, where many of the victims were buried before their transfer that year to the American War Cemetery at Brookwood [England] or to their homeland. Length —549 ft.; Width — 66.5 ft. Passenger Capacity — 271 in 1st cl. ; 246 in 2nd cl. ; 1,900 in 3rd cl. American war correspondent Don Martin reported from London on the sinking of the Tuscania, which was headline news in the New York Herald on Friday, February 8, 1918. A statement from Washington was included in a dark-black-edged box with title, ‘The Tuscania Sinking Makes Us More Determined to Win War, Says Mr. Baker’. “The sinking of the Tuscania brings us face to face with the losses of war in its most relentless form. It is a fresh challenge to the civilized world by an adversary who has refined but made more deadly the stealth of the savage in warfare. We must win this war, and we will win this war. Here are the first paragraphs of the main story, which incorporated Don Martin’s dispatch. The whole story can be found in the February 8 posting at www.soldierofthepen.blogspot.com. A story of disaster at sea, affecting the hearts and hopes of Americans, although they have been schooled to expect it ever since the first contingent of their fighting men left an Atlantic post to become brothers in arms to the Entente warriors who are intrenched against the German hordes, fortunately has dwindled in the telling. One hundred and one lives were lost in the torpedoing of the British troop ship Tuscania off the Irish coast at dusk on Tuesday evening, according to the latest report. Thirty of the crew of 220 perished, leaving the number of Americans dead only seventy-one. A late despatch from an Irish port stated that forty-four bodies of American soldiers had been washed ashore. They bore no identification tags, as the men had not been definitely assigned to units. That they were killed by the explosion was indicated by the fact that few of the bodies were recognizable. It was wishful thinking for this war correspondent to write that the submarine was sunk immediately. UB77 survived the war and so did Kapitanleutnant Meyer. Tuscania was the only vessel sunk by UB77. Granted the conditions of troop ships in general would be cramped, but I would have thought that the lessons of Titanic would have required the ship to be equipped with enough lifeboats for all crew and passengers. Some invariably died in the initial explosion, fire and flooding, but I suspect more could have been saved. There was time. Additional info from the official history of the 168th Aero Squadron as included as Appx. C in 'France on Fragile Wings' - Stine (2013). Some disagreement here on the squadrons onboard! (100th and 213th, or the 100th,158th and 263rd). "On January 27, 1918, we (168th Aero Squadron) moved to Garden City...Everybody was in great spirits as all knew that the move meant going overseas immediately. Before this movement occurred, the C.O. at Garden City called in the C.O. 's of the 23rd, 100th, 213th, 167th and the 168th Squadrons informing them that three out of the five squadrons were to go overseas in two or three days. The 23rd was eliminated as so many of the nen were working at the canteen, telephone exchange and other important work. The 100th and the 213th were chosen, having been organized longer than the 167th and 168th. The 167th was chosen, coming numerically before the 168th. The 100th and 213th sailed on the Tuscania and the 167th was placed under quarantine at the last moment which kept it from going out on the same boat. This is mentioned to show how near the 168th came to being on the ill-fated Tuscania."